Live kernel debug is currently failing for ARM devices. We are working to get this fixed. If you are building an open retail device for commercial deployment to a "specific/limited installation" (i.e. factory or retail store) where the end-user does the final configuration and you document your customers that they must obtain a certificate for WDP and install it on both WDP and connecting browsers and passwords are changed on WDP, then using WDP in this narrow commercial instance is acceptable. Retail images in this scenario should still not include IOT_TOOLKIT, but should use the IOT_WEBBEXTN package to pull in WDP. WDP is a developer tool shared among all Windows 10 devices. Each product has its own unique features, but the core functionality is the same. Documentation for the main features are found on the Windows Device Portal overview page. The rest of the documentation below will be IoT specific. There are two ways to go get the Windows Device Portal up and running. First, you'll want to download the Windows 10 IoT Dashboard, a developer tool that makes it easy to set up new devices. Once you've used the Dashboard to flash a Windows 10 IoT Core image onto your device, check that your device shows up under "My devices". This checkbox has a known bug where it will "flash" from checked to non-checked. Please refresh the page (F5) after clicking to ensure that the checkbox is showing your desired state. Provides install/uninstall functionality for AppX packages and bundles on your device. IoT Core is unique in that it only allows one foreground app to run at one time. The app list is modified to ensure that this is the case. Under the STARTUP column, you can select as many background applications to start by default, but can only set one foreground application. The app file explorer shows the directories that your apps can access. LocalAppData contains folders specific to each app. This folder will be the same name as your app and other apps cannot access it. Any system crashes will automatically be logged and available to view through the web management tool. You can then download the kernel dump and try to figure out what's going on. This is similar to Live kernel dumps, but for the user mode processes. Clicking the download button will cause a 'minidump', and the entire state of that process will be downloaded. This is good for debugging hanging processes. This page shows you all the bluetooth paired devices and all the devices which are discoverable. To pair with another Bluetooth device, put the device in pairing mode and wait for it to appear in the available devices list. Click on Pair link to pair the device. If the device requires a PIN for pairing, it will pop-up a message box displaying the PIN. Once the device is paired, it will show up in the Paired devices list. You can un-pair the device by clicking on Remove. Once you navigate to the Bluetooth page, your device will be discoverable by other devices. You can also find it from your PC/Phone and pair it from there. More information on bluetooth can be found on the bluetooth page. IoT Onboarding provides support for configuring an IoT device's Wi-Fi connectivity options. Internet Connection Sharing (ICS) Internet Connection Sharing allows you to share the Internet access of your device with other devices connected to your device over the Wi-Fi SoftAP. To use this feature, your Windows 10 IoT Device needs to have access to the internet (e.g. through a wired LAN connection). In 'Connectivity->Onboarding->SoftAP settings' click 'enable' and set SSID name and password. 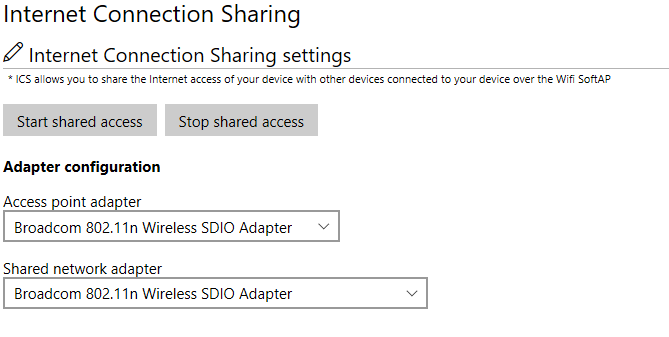 Then in 'Connectivity->Internet connection sharing' for 'access point adapter' select "Microsoft Wi-FI Direct Virtual Adapter #2" and for 'shared network adapter' select your wired ethernet adapter. Finally, click 'start shared access.' Once started, connect a separate Wi-Fi enabled device to the SoftAP on your Windows 10 IoT device. After a connection is established your separate Wi-Fi enabled device will be able to connect to the internet through your Windows 10 IoT device. ICS is disabled when a Wi-Fi profile exists on the device. For example, ICS will be disabled if you connect to a Wi-Fi access point and check “Create profile (auto re-connect)”. SoftAP Settings The SoftAP Settings allow you to control whether or not your device's SoftAP is enabled. It also provides a means for configuring your SoftAP's SSID and the WPA2-PSK key which are necessary to connect the SoftAP from another device. AllJoyn Onboarding Settings The AllJoyn Onboarding Settings allow you to control whether or not your device's Wi-Fi connection can configured through your device's AllJoyn Onboarding Producer. When a separate device running an AllJoyn Onboarding Consumer application connects to your Windows 10 IoT SoftAP, the AllJoyn Onboarding Consumer application can be used to configure your IoT device's Wi-Fi adapter. When enabled, the AllJoyn Onboarding Producer app (IoTOnboarding) uses the ECDHE_NULL authentication method. To use AllJoyn Onboarding with Windows 10 IoT builds 10.0.14393 or earlier requires an update to the IotOnboarding sample which may be downloaded here. Access point adapter is the WiFi adapter that act as a WiFi access point (it usually has an IP address like 192.168.137.1). Shared network adapter is the adapter that connects to Internet (e.g. : Ethernet adapter). SoftAP SSID will be automatically prefixed by "AJ_" if AllJoyn onboarding is enabled and postfixed with the MAC address of the Wifi adapter. The SoftAP passphrase must be between 8 and 63 ASCII characters. The Trusted Platform Module (TPM) is a cryptographic coprocessor including capabilities for random number generation, secure generation of cryptographic keys and limitation of their use. It also includes capabilities such as remote attestation and sealed storage. To learn about the TPM and security on IoT Core, visit the Building secure devices page and the TPM page. Limpet.exe used to be part of Windows IoT Core. Starting with October 2018, it is now available as an open source porject at https://github.com/ms-iot/azure-dm-client. To make testing easier, we have a non-signed pre-built version of Limpet.exe available and can be downloaded right from WDP. You just need to go the 'TPM Configuration' tab and click the 'Install Latest' button. This version of Limpet.exe should not be shipped with your final product. Instead, you need to build the open source project, sign it, and package it with your image. IoT devices can be remotely managed through cloud services. Azure provides a very rich set of services to enable such scenarios. We have created a device management client that complements Azure's Device Provisioning Service (DPS) and Azure's IoT Hub service on the Windows platform and which also exposes several Windows manageability features. The clients will be provided as open source projects. To make testing them easier, we will be providing pre-built binaries. You can use the 'Azure Clients' tab in WDP to install and run those test binaries. This version of the tools should not be shipped with your final product. Instead, you need to build the open source project, sign it, and package it with your image. We will update this documentation once the open source projects are available for consumption. The Windows IoT Remote Server allows users to see what their device is displaying without connecting a physical monitor to the keyboard. Launch powershell and connect to your device. Download TakeRegistryOwnership tool, build it, and copy it to your device. In the Windows 10 Creators Update, the Windows Device Portal added a way for device administrators to install a custom certificate for use in HTTPS communication. To learn more, read the documentation under the Windows Device Portal docs.